Schools and colleges with adequate infrastructure and facilities play a vital role in every student’s development and have a great bearing on their academic and non-academic progress. While those with passion for learning can make do with any environment, having sound infrastructural base to enable quality learning has its unique benefits. For some of you, infrastructure might be a secondary consideration, but haven’t you found a holistic setting more conducive to learning than a crowded classroom? Why would you then be willing to compromise on such key factors? A select few educational organisations understand and respect this sentiment. ASM’s Institute of Business Management and Research (IBMR) is one of the discerning few which continues to dish out some of the best infrastructure to students, in a bid to keep them inspired, eager and on top of their abilities. How does the institute go about achieving this? Read on! The ASM-IBMR library is a temple of limitless learning. Thelibrary is digitally automated, boasting of more than 22,000 national and international books and journals, which add tremendous value to aspirants’learning experience. Also, the institute is amember of DELNET, EBSCO and the British Council Library, which allows both the teachers and students unlimited access to 1,800 e-journals, which work as a rich database for research and serves as the igniting flame for creative and innovative pursuits. 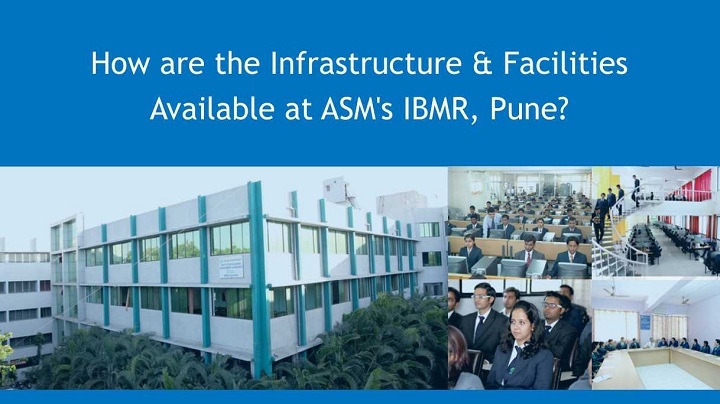 ASM-IBMR has hi-tech computer labs with over 1000 high-end computing terminals. The high-speed internet access enables learners to work quickly and purposefully. The impressive lab facility has IBM AS/400e server and Xeon servers, well-equipped with licensed software. The study space i.e. classrooms here are well-ventilated and spacious,where students canseat themselves comfortably and learn without disturbance. The classrooms have black and white boards, presentation aids, podiums and modern audio-visual equipment for presentation work. The open setting works as a happy environment, helping students unleash their full potential. The canteen is the place where students meet and relax. We call it as a hub for all activities, the breeding ground for all new beginnings. Students are served high-quality food in the hygienic precincts here.We believe that health comes before everything else, and the catering services here dish out nothing short of the very best. At ASM-IBMR, both indoor and outdoor activities are appreciated. We provide awell-equipped gym and facilities for other sports like chess, carom, volleyball, table tennis, basketball, etc. Annual competitions and tournaments are organized to encourage the spirit of participation and competition among the participants. Also, regular meditation, yoga and workshops are provided, to ensure our students lead a wholesome life, by keeping academic stress at bay. Hostels here are ahome away from home for students. The accommodation facility is comfortable and inproximity to general utilities such as hospitals, markets, bus stands, railway stations, etc. With the basic utilities accounted for, students can focus on their studies better and enhance their overall performance levels. Life at ASM-IBMR, with its plethora of quality offerings, raises the benchmark of excellence for its students. An institute that has always believed in pioneering change, the glowing accounts of its illustrious alumni are testament to its ability to transform lives. Excited about finding out how ASM-IBMR can help you spark an academic turnaround?